Chinese internet giants are doing everything, from embracing social media to empowering their rural populations, against the backdrop of strong government support. There are close to three times as many Chinese internet users as the U.S, despite China falling behind the U.S in terms of internet and mobile internet penetration rates, thanks to a more populated China, according to a recent China Internet report released at the annual RISE conference in Hong Kong. China trumped the U.S at a penetration rate of 37% against the 15% in the U.S, only in the mobile payment sector, which could be, in part, due to the robust traditional financial ecosystem in America, slowing down the take-up rate for mobile payments. All of these happenings against the backdrop of global internet penetration rates screeching to a halt. after many years of constant growth. The Chinese internet giants are taking that comparative advantage up another notch, expanding into rural areas, blending the brick-and-mortar with the online world and turning e-commerce into social commerce – effectively the collaboration of social media with online purchases, as revealed by the China Internet report. 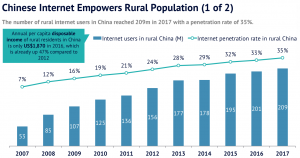 Beyond the top-tier cities in China, these China internet giants have been expanding rapidly, increasing the number of rural China internet users from 53 million in 2007 to a staggering 209 million in 2017, with a penetration rate of 35%. These investments to empower the rural population will be avenues for future growth in a saturated market that consists of mostly higher tier Chinese cities. In fact, as of now, 55 million of the rural Chinese population already are attending live-streaming classes, 78 million of them read online news at least once a month and 175 million of them use the highly addictive short video apps. 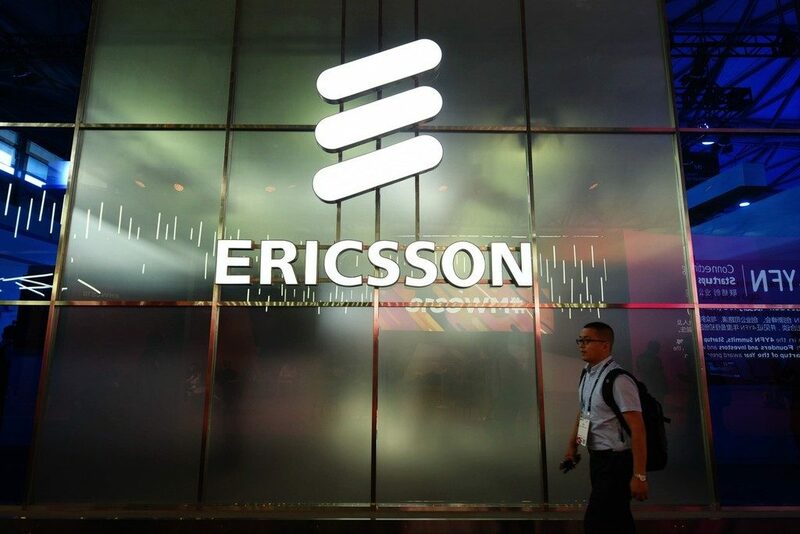 The growth in internet penetration rates also boosted the annual revenue of internet giants by US$19 billion and also helped create 1.3 million new jobs. With the Chinese government setting aside 8% of its annual budget to educate the rural Chinese on digitization, this acceleration will only look to quicken. The target is for at least half of China’s poor villages to have access to online shopping capabilities – which can fuel further revenue growth for the Chinese internet giants. The e-commerce wave in China has become more innovative. E-commerce giants such as JD has joined the online-to-offline new wave, launching 7Fresh – its first offline fresh-food supermarket. 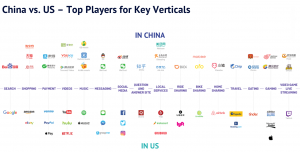 Tencent, a Chinese internet giant, too has ventured into this sector with Super Species. Alibaba, on the other hand, the one who coined this concept as ‘new retail’ has its own version of Hema stores. 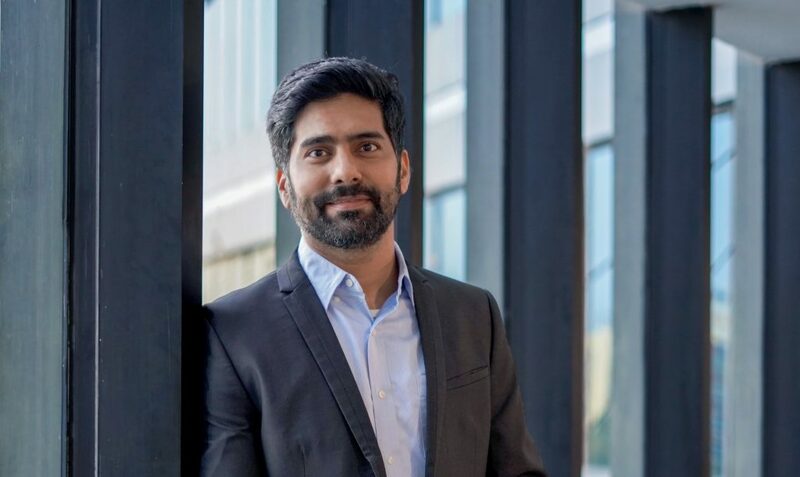 This concept will reach out to even more consumers, leveraging technology to make the offline shopping experiences better – by using big data analytics to offer more personalized recommendations. 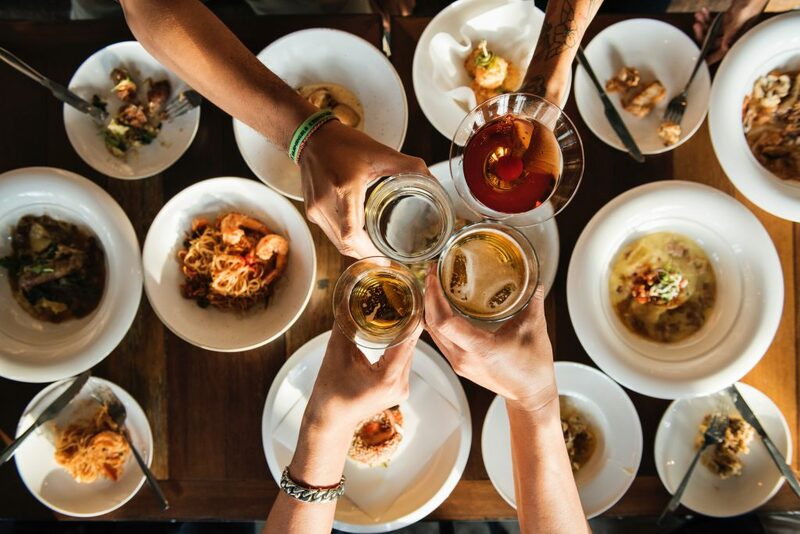 Essentially, consumers get to shop, dine and order fresh groceries all within one app. 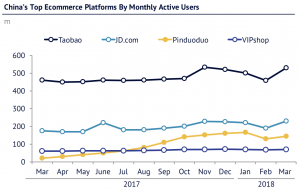 Despite China’s top e-commerce platform still dominating, the rise of Pinduoduo to become the 3rd most popular e-commerce app gives rise to the new trend of social commerce – where a social media-backed e-commerce platform helps to boost sales. Taking Pinduoduo as an illustration, the social platform feature allows for communication – driving value-for-money deals group buys when compared with the higher priced deals in the Taobaobao app. This social commerce app has 156 million monthly active users (MAU), as of the end of 2017. Xiaohongshu, or Little Red Book as it is known, is another example, generating up to 30 million MAUs as of 2018. Little Red Book operates right in the middle of Instagram, Pinterest and Amazon – allowing users to post and tag pictures on the platform. 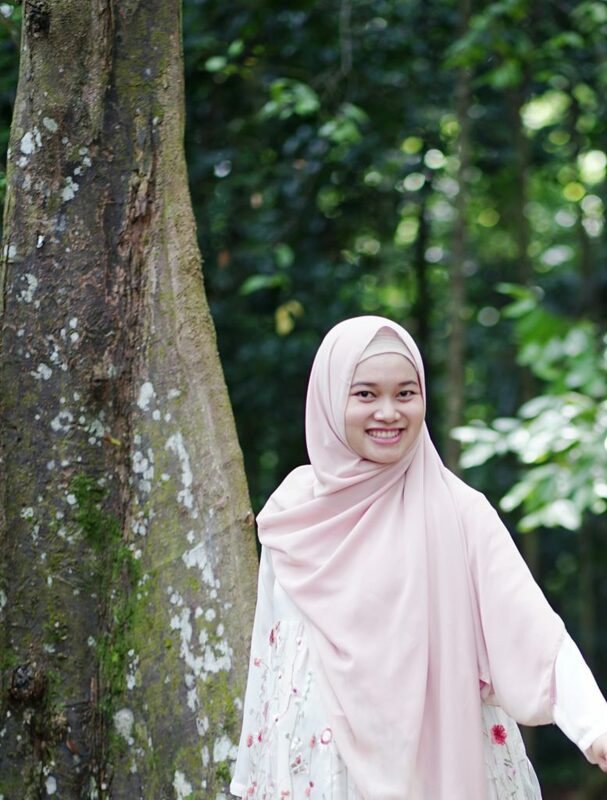 While this is the case in the e-commerce sphere, this new vertical has spread to more than just commerce platforms into both the media & education platform segments. For example, Douyin, a fast-growing short video app for news aggregator Bytedance, started to collaborate with e-commerce giant Alibaba, allowing its users to buy items from the latter’s platforms, building on the synergies of its traffic and the monetization capabilities of a commerce platform. 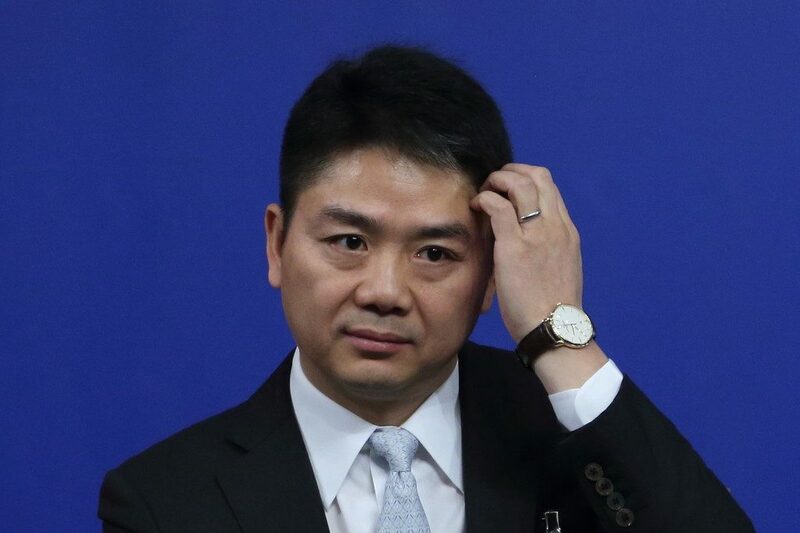 By building on existing growth areas of a huge country and the other two out-of-the-box extensions, China is leveraging its strong governmental support and comparative advantages very quickly. 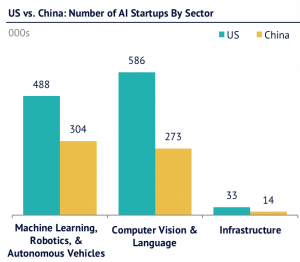 However, it is still behind the U.S in the race towards the development of artificial intelligence technologies.